Practical gifts are a great way to give a gift that keeps on giving. These shopping ideas are a few gifts that I have purchased for friends and family this year. Happy Shopping! Merry Christmas, my dear friends. It’s that time of year again where we put up our favorite prepper gift suggestions. As many of you know all too well, prepping is an investment. As we move toward more longer-term preparedness needs, the items can get more expensive. That said, Christmas is an excellent opportunity to make these investments. I have always been one that leans toward the more practical gifts, rather than the extravagant. While there are some great online deals to take advantage of, I wanted to share the prepper gifts that I have bought in the last few weeks for my friends and family. Some of these would make excellent stocking stuffers, as well. I wish all of you a very Merry Christmas full of joy, peace and love! I bought this gift for my family. In my opinion, you can never have enough ways to store water and these Water Bricks will be a lifesaver when the time comes. We all need long-term storage options for a sustainable water supply, and while I recommend every home have water catchment systems hooked up, not all homes have this capability. Water bricks make an excellent alternative. Water Bricks are BPA free and FDA approved. As well, if you have plenty of water stored, these containers can also be used for water or foods like rice, beans, or anything you want to keep safe and dry from the elements. As well, if an eight pack of water bricks is too much for you, there are also single containers for $24 you can purchase. I bought a few pre-made survival backpacks for family members to have in their vehicles this year. While I am more apt to making my own survival pack, Wise Foods has a nifty emergency bag that seemed close to perfect. I added some extra Mountain House food and a LifeStraw water filter to it – added a bow; and viola! This survival pack gives an individual everything they need in order to survive for five days – including a first aid kit and a deck of playing cards to pass the time. This kit has it all! With a shelf life of up to 25 years, this survival kit will be there when you need it. Loading bullets into magazines is time-consuming and can be pain after a while. This ammunition loader will be well received for a Christmas gift and will help make better use of your time. This loader is great because it loads all 9mm Luger, 10mm, .357 Sig, 10mm, .40, and .45ACP cal. single and double stack magazines. Speaking of firearms, if my husband asks, don’t tell him that he’s getting this for Christmas! This fleece jacket keeps you warm and hides your firearm with a built-in conceal plate. The holster fits a variety of firearms. Note: This jacket is designed for right-handed cross-draw only. It is waterproof, windproof and has an integrated shoulder harness to distribute the weight of the firearm at the shoulder. Isn’t it awesome! I’m not going to lie; I bought this for me. I love self-defense gadgets and couldn’t resist having this one on stand by. It charges quickly and will deliver a big shock to someone who ventures too close to me. The tactical flashlight has a rechargeable battery, and provides ample light for added security. For those of you who have loved ones in college or work late hours, this would make a great gift! If you have game trails nearby, these snares can help you catch wild game. In a long-term emergency, using snares to catch food is one of the easiest ways to trap. Keep in mind that not all snares will catch the same types of animals; that’s why I like this snare kit. It has snares to trap large animals like hogs, medium snares for raccoons or coyotes and smaller snares for rabbits and squirrel. Enough cannot be said about this amazing fixed blade. If you want to learn more about this, I wrote an article recommending this knife. This is not your average “survival” knife found in the camping section of a department store. This knife is made from high quality products and has been field tested. I have a lot of knives, but this is, by far, my favorite. Every car needs a car hammer. This survival tool features two lifesaving abilities when your car is sinking: it can cut through a seat belt and break windows to make an escape. In this type of emergency, you want to get out as fast as possible; and when you are in a situation where your car is sinking, seconds matter! Because the windows are made of strong, tempered glass, it is important to have an accessible tool, like a car safety hammer. I purchased this portable charger for my son. His cell phone is always running low on battery strength, so I decided to get his this to put in his backpack for school. This is a compatible charger that fits most phones and iPads. As well, it has a good price tag to go along with it. This 462 page best-seller is a must-have for your prepper library. Each chapter uses real-life scenarios to help the reader prepare for any disaster. The well-rounded, multi-layered approach outlined in the Prepper’s Blueprint coaches the reader to make sense of a wide array of preparedness concepts through easily digestible action items and essential supply lists. Not matter what type of prepper you are shopping for or what stage they are into with prepping, there are plenty of options available. To gather even more ideas, check out last year’s stocking stuffers list. As well, check out the best-selling Prepper’s Blueprint which has 52 different lists of prep items you can gather ideas for. It is also featured on websites like SHTF Plan, The Economic Collapse Blog, and The Survivalist Blog. 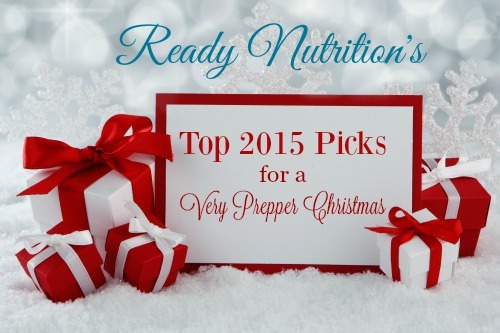 I hope these Top Picks will help you find the perfect gift for your special prepper. Happy Shopping!